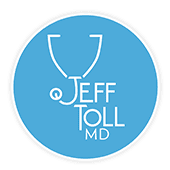 Dr. Toll believes the American health system is broken, slow, and has not adapted to modern times. Patients are often forced to navigate a confusing and fractured system of specialists. In our practice, we have developed an exclusive purposely limited panel of members that allows him to give each patient and their families the time and attention they deserve to maximize their health and wellness, coordinate care, and use new technologies to help make delivery of care easier and more convenient. Timely Access for Acute Care – same day appointments and urgent visits, with access to your physician by phone and email. House Calls – if you are sick or injured, wouldn’t it be nice to have the doctor come to see you instead of the other way around? Longer Appointments – with our practice model, we are not rushed in 15-minute appointments slots. Our appointments last as long as they need to, to address ALL patient’s needs and questions. Preventative Health Care – we believe that by living healthy and having appropriate screening tests and visits with our physician, even when feeling healthy, we can prevent illness in the future. Cancer Screening - age-appropriate cancer screening is vital to our long-term well-being. For those patients with family histories of cancer or just those interested, we also offer genetic testing to look for mutations that may predispose patients to specific cancers. Stress Management – as part of our holistic approach, we believe stress management is vital to prevent illness, and we provide a number of individualized techniques for stress management. Mental Health – we recognize that mental health is a significant part of our wellbeing and an extremely under treated part of normal healthcare. We strive to address all mental health issues, however impactful, and offer a number of services in this regard. Substance Abuse Management – with no judgment or criticism, we take an extremely individualized approach to helping people with their substance abuse problems, whether these problems are with alcohol, prescription drugs and/or other illegal drugs. We understand that every individual is different when it comes to how these problems started and grew, and as a result, individuals have very different strategies to combat and conquer their addictions and get into a sustained recovery. Tobacco Abuse – tobacco abuse is one of the leading causes of heart problems, stroke, and cancer. And our mission is to have a completely smoke free patient panel, both for our patient’s health and their families health free from second-hand smoke. Health, Fitness, Diet, Weight Loss – in our practice we believe it is important to not only treat disease and illness when they arrive, but to help people prevent illness by practicing healthy daily living. We help set fitness goals and are experimenting with using activity trackers to assist us in reaching our fitness goals. End of Life Care – at the end of life there is an inherent conflict between extending days to weeks of life with preventing symptoms and making people comfortable in their last stage. This is a very delicate balance that requires personal and close attention and those needs will be met by our experienced staff. Home Care - Assistance with setting up home nursing and home caretakers for those in need – whether it is short term after an acute illness, or long-term care for those with chronic conditions or dementia, we help set up and accommodate for all the needs of our patients.